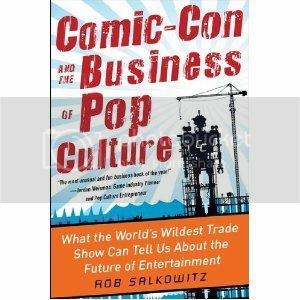 Comic-Con wasn’t always the packed, “see and be seen” cultural juggernaut it’s become, as Salkowitz details in the early chapters of his book. In fact, 43 years ago, when the first Con was held at the US Grant hotel in San Diego, led by the efforts of comics superfan Shel Dorf, only 300 people came! In its early days, Comic-Con was a casual place where the titans of comics publishers such as DC and Marvel would gather with fans and other semi-professional artists to exchange ideas and critique one another’s work in an intimate setting. In fact, Salkowitz, a long-time Con attendee who has garnered quite a few insider perks along the way over the years, recalls that his early days of attendance were not quite so harried and frantic. 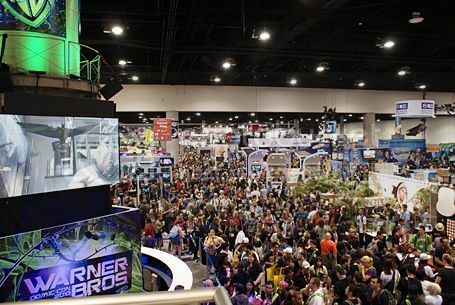 The audience for Comic-Con steadily grew until about 2000, when attendance began skyrocketing, to the point that it now takes over an entire American city for a week each year. Why did this happen? Salkowitz argues that this time period is when a quantum leap shift occurred away from comic books and towards comics culture, a platform that transcends graphic novels and traditional comic books and usurps the entertainment and business matrices of television, film, video games and other “mainstream” art. Indeed, when ScriptPhD last covered Comic-Con in 2010, even their slogan changed to “celebrating the popular arts,” a seismic shift in focus and attention. (This year, Con organizers made explicit attempts to explore the history and heritage partially in order to assuage purists who argue that the event has lost sight of its roots.) In theory, this meteoric rise is wonderful, right? With all that money flowing, everyone wins! Not so fast. The holy grail of Comic-Con — the exhibit floor, a place of organized chaos where merchants mix with aspiring and current artists, large companies and media empires. that are the underbelly of the current “peak geek” saturation. A brief divergence to the downfall of the traditional publishing industry, including bookstores (the traditional sellers of comics), the reliance of comics on movie adaptations and the pitfalls of digital publication is a must-read primer for anyone wishing to work in the industry. Even more strapped are merchants that sell rare comics and collectibles on the convention floor. Often relegated to the side corners with famous comics artists so that entertainment conglomerates can occupy prime real estate on the floor, many dealers struggle just to break even. Among them are independent comics, self-published artists, and “alternative” comics, all hoping to cash in on the Comic-Con sweepstakes. Comics may be big business, but not for everyone. Forays into the world of grass-roots publishing, the microcosm of the yearly Eisner Awards for achievement in comics and the alternative con within a Con called Trickster (a more low-key networking event that harkens to the days of yore) all remind the reader of the tight-knit relationship that comics have with their fan base. Business and brand expert (and Comic-Con enthusiast) Rob Salkowitz. In many ways, the comics crisis that Salkowitz describes is not only very real, but difficult to resolve. The erosion of print media is unlikely to be reversed, nor is the penchant towards acquiring free content in the digital universe. Furthermore, video games, represent one of the biggest single-cause reasons for the erosion of comics in the last 20 years. Games such as Halo, Mass Effect, Grand Theft Auto and others, execute recurring linear storylines in a more cost-conscious three-dimensional interactive platform. On the other hand, there are also a myriad of reasons to be positive about the future of comics. The advent of tablets (notably the iPad) represents an unprecedented opportunity to re-establish comics’ popularity and distribution profits. Traditional and casual fans of comics haven’t gone anywhere, they’re just temporarily drowned out by the lines for the Twilight panel. A rising demographic of geek girls represents a potential growth segment in audience. And finally, a tremendous rise in popularity of traditional comics (even the classics) in global markets such as India and China portends a new global model for marketing and distribution. If superheroes are to continue as the mainstay of live-action media, the entertainment industry is highly dependent upon a viable, continued production of good stories. Movies need for comics to stay robust. The creativity and ingenuity that has been the hallmark of great comics continues to thrive with independent artists, some of whose work has gone viral and garnered publishing contracts. 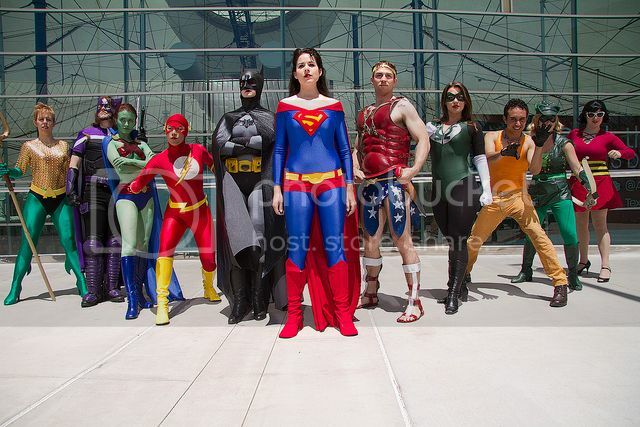 A group of fans gathered outside the San Diego Convention Center to pay homage to the original reason Comic-Con was established! Make no mistake, comics fans and enthusiastic geeks. Comic-Con and the Business of Pop Culture is very much a business and brand strategy book, centered around a very trendy and chic brand. There’s no question that casual fans and people interested in the more technical side of comics transmedia will find it an interesting, if at times esoteric, read. But for those working in (or aspiring to) the intersection of comics and entertainment, it is an essential read. Cautioning both the entertainment and comics industries against complacency against what could be a temporary “gold rush” cultural phenomenon, Salkowitz nevertheless peppers the book with salient advice for sustaining comics-based entertainment and media, while fortifying traditional comics and their creative integrity for the next generation of fans. The final portion of the book is its strongest; a hypothetical journey several years into the future, utilizing what he calls “scenario planning” to prognosticate what might happen. Comic-Con (and all the business that it represents) might grow larger than ever, an absolute phenomenon, might scale back to account for a diminishing fan interest, might stay the same or fraction into a series of global events to account for the growing overseas interest in traditional comics. Which one will come to fruition depends on brand synergy, fan growth and engagement, distribution with digital and interactive media, and a carefully cultivated relationship between comics audiences, creators and publishers. Salkowitz calls Comic-Con a “laboratory in which the global future of media is unspooling in real time.” What will happen next? Like any good scientist knows, experiments, even under controlled circumstances, are entirely unpredictable. See you in San Diego next year! 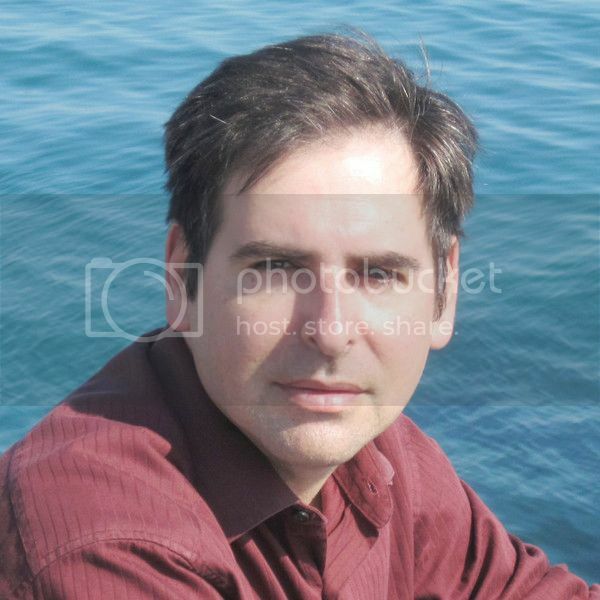 Rob Salkowitz is the cofounder and Principal Consultant of Seattle-based MediaPlant LLC and is the author of two other books, Young World Rising and Generation Blend. He also teaches in the Digital Media program at the University of Washington. Follow Rob on Twitter.